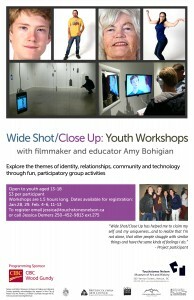 Workshops for Youth Offered at Touchstones/’Wide Shot/Close Up’ — Watershed Productions Inc. 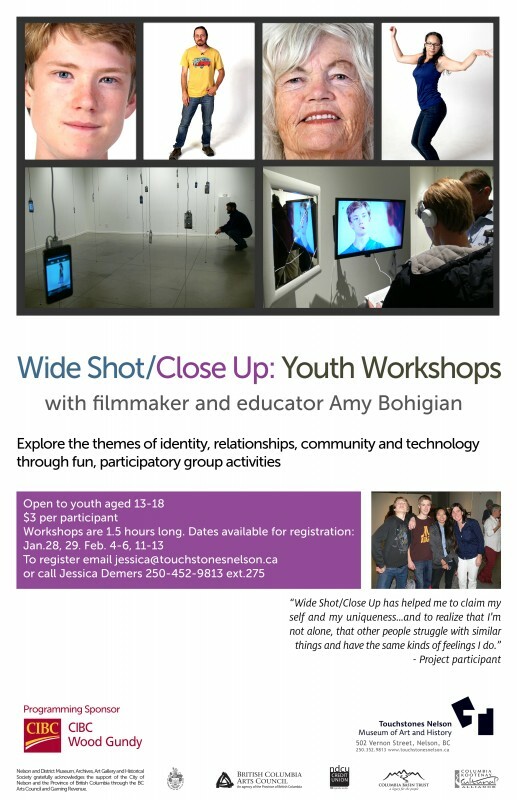 Touchstones Nelson is offering workshops for youth aged 13-18 in conjunction with the current exhibit ‘Wide Shot/Close Up’. See the Nelson Star article here. Small or large groups from various schools or organizations are welcome as workshops will be customized based on the function of the group. For instance, theatre classes can come explore identity and characterization, a social studies class can come explore the significance of stereotyping and models of community building and a media related course could explore themes of individual and group expression and perception through the use of technology. Workshops run January 28, 29, February 4-6 and 11-13 on Wednesdays, Thursdays and Fridays and each can run for 1 to 2 hours in length depending on the needs of the group. They will be facilitated by the artist and filmmaker who created the exhibit, Amy Bohigian. The exhibit is up at Touchstones until February 15th. Here’s the article that Will Johnston wrote for the Nelson Star. One part art installation, one part social experiment and one part community development exercise, Wide Shot/Close Up is intended to expose and explore how individuals present their own identity to others and how this impacts the way community is built. It is meant to engage a larger audience about the questions of how people from various backgrounds and beliefs can connect in meaningful ways. This project is funded by a major project grant from the Columbia Kootenay Cultural Alliance and the The Mir Centre for Peace is partnering with Watershed Productions on content and delivery. The Presenting Sponsor is Kootenay Co-op. Thanks to the following people for the support: Joy Barrett, Jane Byers, Jocelyn Carver, Jim Drake, Ian Johnston, Daryl Jolly, Gregory Mackenzie, Janet McCulloch, Miriam Needoba, Rachel Schmidt, Diane Walters, Bryan Webb, Rachel Yoder. Big gratitude for the courage and open minds of these people for showing up to participate: Allison Alder, Jen Callow, Gisele Chouinard, Jennifer Craig, April Cuffy, Rick Galbraith, Dagmar Galt, Shane Hainsworth, Margaret Hornby, Lena Horswill, Helen Kissinger, Laran Kriese, Donna Macdonald, Chris MacMillan, Lil Maio, Lily Mayall, Kendall McPherson, Lily Miller, Gary Ramsbottom, Sacha Sebestyen, Shelley Stetsko, Isaac Thiessen, Max Thiessen, Brian Zacharias. Posted on January 10, 2015	in Events, Filmmaking, Resource. Bookmark the permalink.